GameTomo is proud to announce the release of Acts 3 and 4 of high-speed mech action game Project Nimbus for the PS4 in Japan. The low priced DLC, titled Project Nimbus: Rise Mirai, features all remastered graphics for the PS4, a dazzling new UI weapon wheel, and a never seen before infinite mission sequence called WARFRONT. 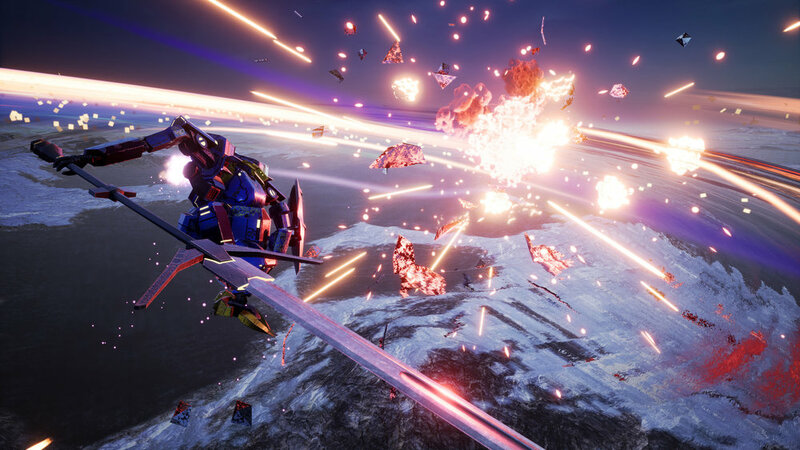 Project Nimbus is an exciting mech-based flying game inspired by the Gundam, Macross and Ace Combat series. The successfully Kickstarted indie hit features vibrant graphics, blistering action gameplay and an epic storyline. Sprawling missions in a variety of locations, featuring new playable Battle Frames, new weapons including homing lasers and the Ballistic Sword, and new trophies. Brand new WARFRONT mode includes massive replayability with six unlimited mission modes including Base Defense, Interception, and Assassination. Six levels of pilot (including Legendary) and Battle Frame customization will keep you playing for hours more. New UI includes “3D radar” and new Weapon Wheel weapon selection system. Low DLC price for purchasers of Project Nimbus: Code Mirai, or new players can buy the Complete Edition with all content. Project Nimbus is a high speed mech action game featuring over a dozen playable mechs with weapons including smart missiles, energy blades, particle cannons, floating energy shields, railguns and autonomous psychodrones. The four act storyline involves epic battles between three different factions over a war torn futuristic planet. Coming November 29th on the Japanese PS4 online store.